If you’re thinking of embarking on a journalism career to make money, forget it. If you like meeting interesting people, then this is the profession for you. Example. 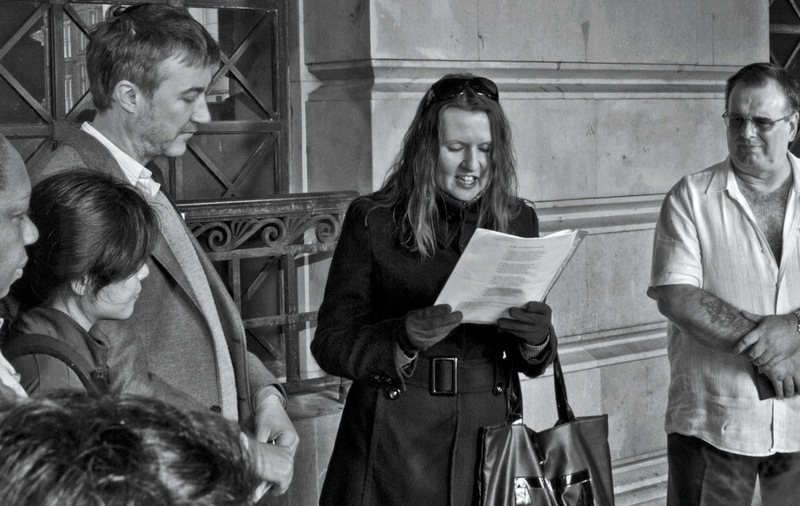 As part of the Festival of Words I did a literary walk around Nottingham with Michael Eaton. We agreed to make it a donation event so that anybody could join in. Our motivation was to share our love of the local literature scene in the hope that people would feel better about their city now that they could point out where Graham Greene once worked as a sub editor. We collected £30 in donations at the end of the two hour trot which went towards a round that came to £27.50. I was amazed that I had £2.50 left over which we could split. Then the Irish coffee turned up for one of our guests and I’d forgot to tell the barman she was allergic to milk. Another was ordered costing £3.75, meaning I was £1.25 down. I didn’t ask Michael for his 62p. As far as literature events go this was a more than reasonable loss. 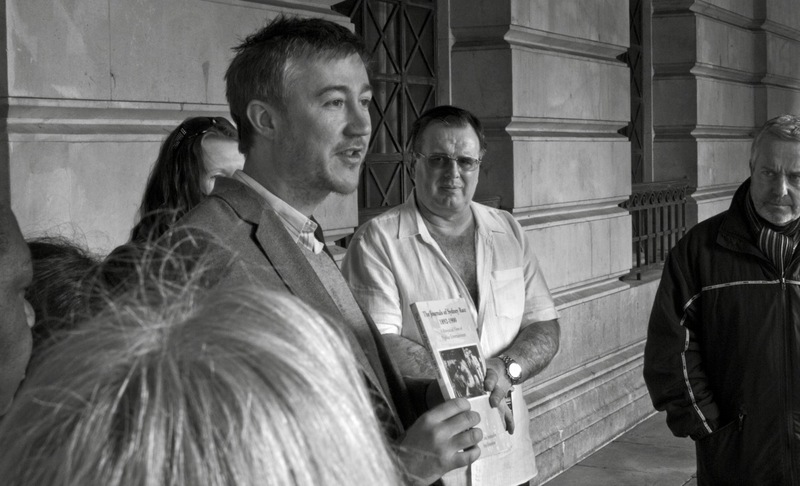 What I got out of the walk was the opportunity to spend two hours with Michael Eaton. Michael has a remarkable memory, having researched much of the city and its characters for his plays. An anthropologist at heart he’s fascinated by people. His motivation for writing about Harold Shipman was that they shared similar backgrounds yet had chosen such differing paths. He loves his documents as well, bringing an immaculate copy of William Booth’s In Darkest England along for the journey which he proudly informs was passed down from his grandfather. Michael is a Dickensian character, large of frame and eccentric in character. He informs that Philip James Bailey’s Festus is the longest poem ever published with more words in it than the Old Testament. He throws his head back for dramatic effect, nearly nutting the person behind him. When this fails to receive a gasp he lowers his head forwards as if the knowledge is weighing him down. Then he bursts into life again, contorting his neck sideways, catching the eye of the woman to his left who he stares at intently until he gets the reaction he believes such facts deserve. Before you can roll a tab he’s singing Billy Merson songs and insisting you join in, jumping around with an ease that is unbefitting of a man his size. And then he’ll turn to the nearest person and take their hand, holding it softly as he imparts more information. You feel slightly embarrassed to be stood in public holding an older man’s hand. And then calm. Like you’ve just been whisked back to childhood and are waiting with a parent for the bus. 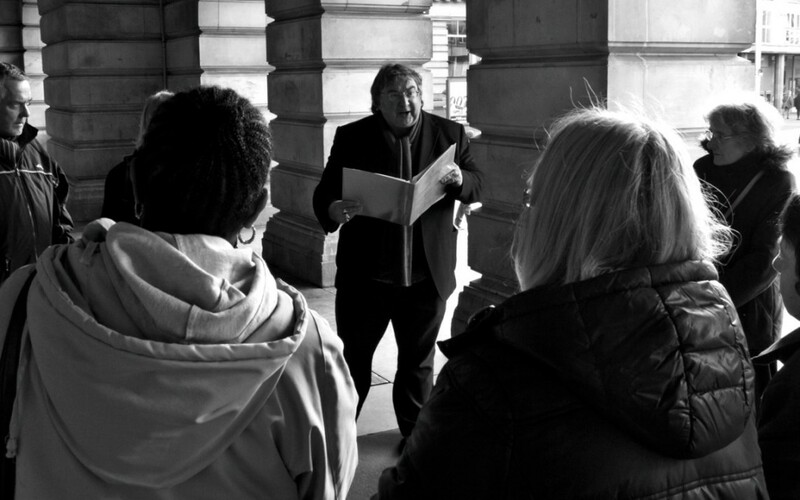 Our second festival walk on Wednesday saw 35 people turn up in the freezing cold. I couldn’t believe it. 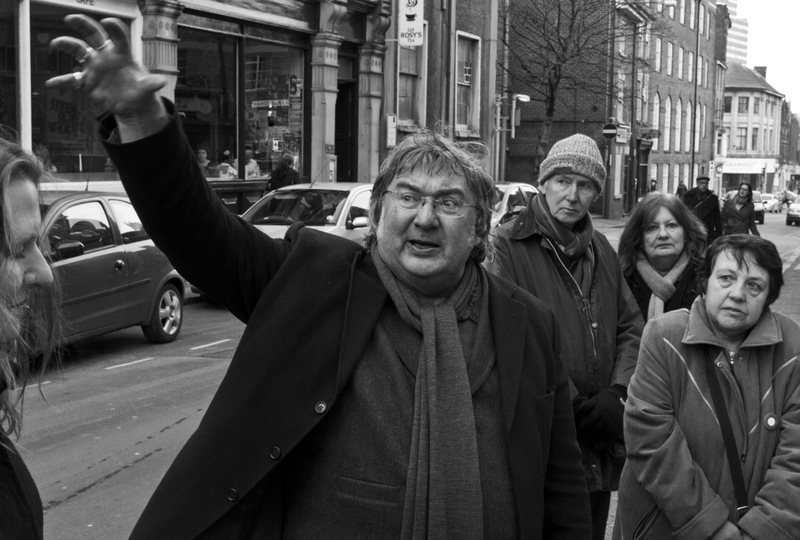 It was a magical walk with punters sharing their own interpretations of folklore as we went along, filling the streets with more stories. 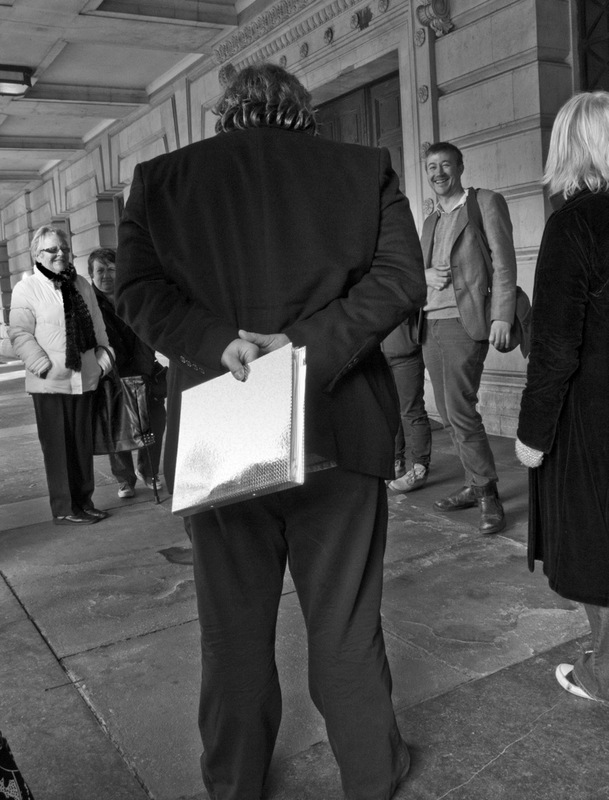 I wasn’t surprised at how many were oblivious to the plaques scattered around the city and our rich literary heritage. Nottingham has never been very good at standing up for itself, preferring to concentrate energies on taking others to task. That’s why we decided to do the walk. So that Nottingham could see something else lurking between Primark and the latest Tesco Express. As promised, here’s a suggested reading list for some of the walk. Market Square James Walker (2012) Sillitoe Trail and Ann Featherstone (2007) The Journals of Sydney Race, 1892-1900. This entry was posted in Events, Reader and tagged festival of words Nottingham, literary walk, Michael Eaton by James. Bookmark the permalink.